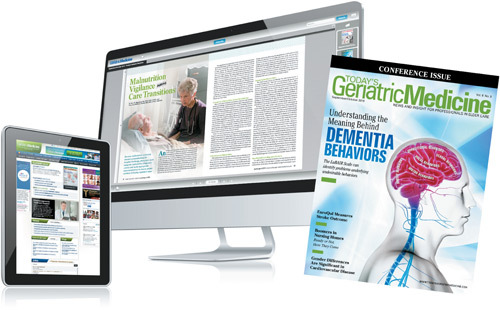 Today's Geriatric Medicine provides advertisers with a unique opportunity to connect with an expanding audience of geriatrics professionals and care team members, including geriatricians, primary care physicians, nurse practitioners, physician assistants, dietitians, social workers, and occupational/physical therapists. These elder care professionals are ideally positioned to recommend medications, technological innovations, assistive devices, durable medical equipment, and nutrition-related products that are essential to the safety and healthful daily routines of their patients. Audience: Qualified recipients include geriatricians, psychiatrists and other physicians, nurse practitioners and physician assistants. Also qualified are educators, psychologists, professional geriatric care managers, gerontologists, physical, respiratory, and occupational therapists, nurses, pharmacists, counselors, social workers, dietitians, facility administrators, directors of nursing, presidents, managers/supervisors, students and other titled and non-titled personnel within the field served.